A couple weeks ago, Chipotle announced they were removing genetically engineered crops (called GMOs) from their menu. Kind of. As you might expect, the announcement was covered widely in the media. Interestingly, though, most of the coverage wasn’t very positive. There’s a fairly long list of responses to the Chipotle decision if you’d like to read more about it. A variety of issues are covered in those responses, but I wanted to take a deeper look into the impact this switch might have on pesticide use. This is a point I’ve made several times in the past. There are two types of herbicide-resistant sunflower grown in the US, ExpressSun (from DuPont) varieties which are resistant to sulfonylurea herbicides, and Clearfield (from BASF) varieties that are resistant to imidazolinone herbicides. [Side note: if you want to avoid chemicals that are difficult to pronounce, neither of these options seem like a trade up.] 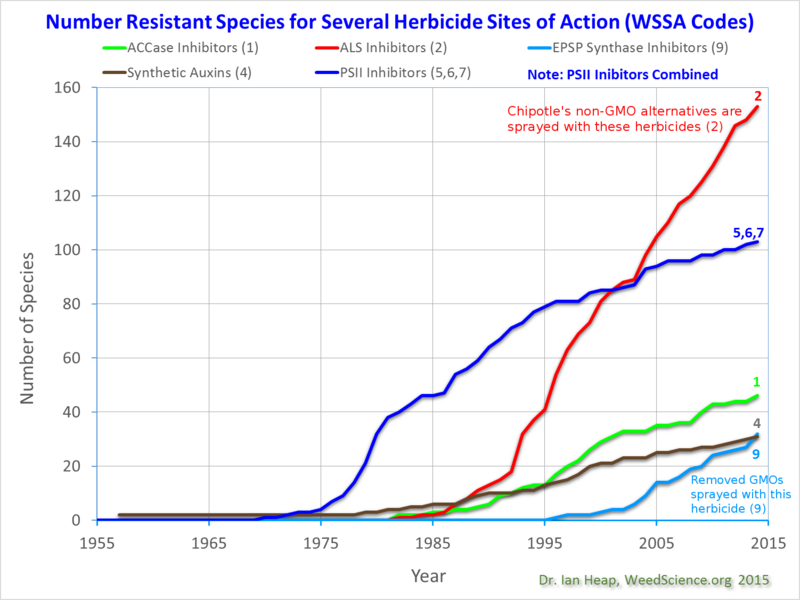 Both the sulfonylurea and imidazolinone herbicides are ALS inhibitors, or WSSA Group 2 herbicides. Glyphosate, the herbicide used in the GMO crops that Chipotle removed, is an EPSP synthase inhibitor herbicide (WSSA Group 9). The figure below from weedscience.org (annotations in the plot regarding Chipotle are mine) shows the number of herbicide resistant weed species to these (and other) herbicides. Herbicides used in the non-GMO alternatives chosen by Chipotle have indeed contributed to more herbicide resistant weeds than the herbicides used in GMO crops. It is pretty clear that if “superweeds” are really a problem Chipotle wants to solve, this is a pretty strange direction to take. A related concern, according to [Chipotle], is that herbicide-resistant GMOs encourage overuse of herbicides. Wouldn’t the right response to that esoteric concern be to avoid products grown with herbicides? But Chipotle isn’t sourcing ingredients that are herbicide (or other pesticide) free. The non-GMO crop alternatives they are using have almost certainly been sprayed with pesticides. But which pesticides? Moreover, herbicide-tolerant GM seed varieties allow farmers to replace toxic pesticides with more benign ones, and to forgo tilling operations that worsen soil depletion and nutrient runoff. Other GM seed varieties produce a naturally occurring protein that kills common crop pests and is, nevertheless, harmless to humans. These crops eliminate the need for some pesticides altogether. Although these claims are common, I haven’t been able to find an analysis that really provides details on what Chipotle’s switch to non-GMO crops really means with respect to pesticide use. So my evenings for the last couple weeks have been spent looking up information about pesticides used in corn, soybean, and sunflower (I even looked up some canola data, if anyone is interested). Although it is impossible to determine exactly which pesticides would be used in the non-GMO crop fields where Chipotle is sourcing their ingredients, I think the information here should give some us a pretty good idea. In the last couple years, over 85% of corn acreage in the US was planted to GMO hybrids. Two traits make up the vast majority of these GMO acres: (1) Bt, and (2) herbicide resistance. Bt traits allow the corn to produce protein(s) that make the plants resistant to several important pests, including corn rootworm and European corn borers. The herbicide-resistance traits allow farmers to spray glyphosate (the Roundup Ready trait) or glufosinate (the Liberty Link trait) on the crop to control a vast majority of the weeds in the field. So a switch to non-GMO corn will likely have impacts on both herbicide and insecticide use. Bt traits are widely credited with reducing the need for insecticide use, so the logical impact of using non-GMO corn varieties would be to increase insecticide use. However, this isn’t necessarily the case in corn. One of the primary targets of Bt corn is the corn rootworm beetle larva, which feeds on the roots of the corn. Using an extended crop rotation (planting corn only 1 out of every 3 or 4 years) is an excellent way to control corn rootworm without use of insecticides. Even a 2 year rotation of corn and soybean would be sufficient to reduce corn rootworm below economic levels in some growing areas. The other major target of Bt corn is the European corn borer. Widespread adoption of Bt corn in the US has reduced the population of this pest so dramatically that even non-Bt corn growers have benefited. So it is not a foregone conclusion that non-GMO corn would see an increase in insecticide use. All else being equal, though, it is likely that insecticide use would be somewhat greater in non-GMO corn fields. So which insecticides would be used? The table above (click to open a larger, readable version) shows insecticide use data from the most recent USDA-NASS pesticide survey in corn (2010). These are the insecticides that were being used most commonly for rootworm and corn borer control; therefore, these are the insecticides most likely to increase in non-Bt corn fields. Acre-treatments in the table above (and subsequent tables) is simply the total amount of pesticide applied divided by the per-acre application rate of the pesticide. It is an approximation of how many acres were treated with that particular pesticide. For example, tefluthrin was applied to approximately 2.1 million acres of corn in 2010. European corn borer is unlikely to make an immediate resurgence in a non-GMO field (since that field would likely be surrounded by GMO fields), so the insecticides applied at-planting to control rootworm (not rootworm beetles) are the most likely to increase in Chipotle’s non-GMO corn fields. Only one of the corn insecticides isn’t a Restricted Use Pesticide (RUP). RUP is a designation that EPA uses for pesticides that have some characteristic that make it more dangerous to use than a general use pesticide. Most of the corn insecticides are RUP because of their high toxicity to fish and other aquatic organisms. Signal words on pesticide labels alert users to acute toxicity risks. These signal words include CAUTION (lowest toxicity), WARNING (moderate toxicity), DANGER (high toxicity) and DANGER-POISON (also includes the skull and cross-bones; the interpretation is obvious). Nearly all pesticides that carry the DANGER-POISON signal words are also RUP. 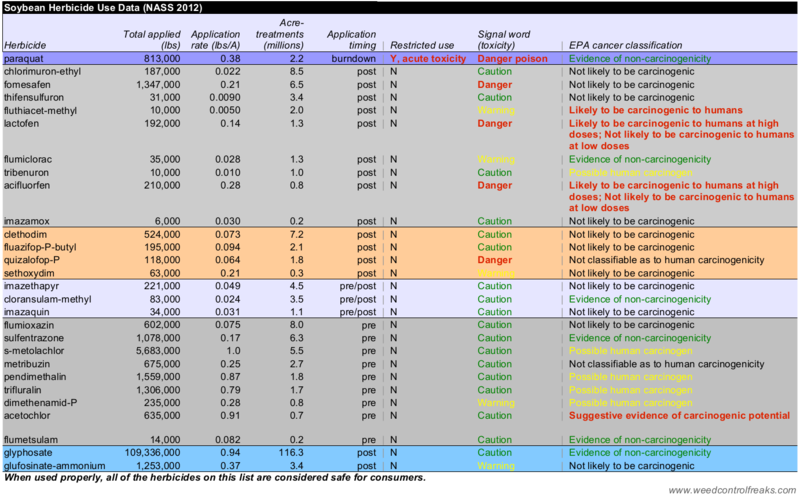 The final column in the table provides the EPA’s cancer risk classification for each pesticide, ranging from the lowest risk (evidence of non-carcinogenicity) to the highest risk (evidence of carcinogenicity). One important note for all the tables provided: I have a lot of faith in the rigorous EPA review and registration processes. So even with the RUP designation, the signal words, and the cancer risks provided in these tables, the pesticides are considered safe for consumers when used appropriately. So I don’t think Chipotle’s corn tortillas are less safe just because they were more likely to be treated with terbufos. But as a pesticide applicator, I would personally rather plant a Bt corn hybrid than apply terbufos if given the choice. Although it is debatable how much insecticide use would increase with a shift from GMO to non-GMO corn, there is no doubt that there would be a major shift in corn herbicide use if switching from Roundup Ready (or Liberty Link) to non-GMO varieties. In 2010 around 70% of corn acres were herbicide resistant, and glyphosate was the most used herbicide, accounting for around 76 million acre-treatments. Herbicides with high values in the acre-treatments column below are probably the most likely replacements for use in non-GMO corn. These include herbicides applied to the soil at planting time (like atrazine, S-metolachlor, and acetochlor), and herbicides applied after the corn has emerged (like mesotrione, 2,4-D, and dicamba). The most common PRE herbicides in the list are more effective on grass weeds, while the most common POST herbicides in the list are more effective on broadleaf weeds. The reality is that most non-GMO acres would see a combination of PRE and POST herbicides applied. Ironically, 2,4-D and dicamba have been demonized by many anti-GMO activists and journalists (see “Agent Orange Corn“); but because they have a similar use pattern and control many economically damaging weeds, 2,4-D and dicamba will be among the herbicides most likely to be applied to Chipotle’s non-GMO corn. There are no Bt soybean traits being grown in the US or Canada; the only GMO trait in this crop is herbicide resistance (again to glyphosate and glufosinate). Chipotle has stated that their primary shift was away from soybean oil to using sunflower oil (no GMO varieties of sunflower have been developed). This makes the comparison a little more tricky, since pesticide use in sunflower hasn’t been quantified by USDA-NASS since 1999, and this was before GMO soybean had reached a majority of US acreage. Soybean pesticides, though, were estimated in the 2012 NASS survey. A majority of soybean acres were sprayed with only one herbicide in 2012: glyphosate. It is possible that Chipotle may source non-GMO soybean; if so, the most likely herbicides to be applied would probably include herbicides with similar toxicological properties as glyphosate (Caution signal word, not restricted use). Some exceptions would include fomesafen and lactofen, both of which carry the DANGER signal word indicating greater acute toxicity risk to the applicator. But overall, most of the soybean herbicides are pretty safe to both applicators and wildlife. Since recent sunflower herbicide use data wasn’t available from USDA-NASS, I looked up recommendations from sunflower production guides from North Dakota State University and Kansas State University. In my region, it is uncommon to grow sunflower without the use of a soil-applied herbicide to control weeds early in the season. The exception would be if Clearfield sunflowers are grown, which may only be sprayed with imazamox after the crop and weeds emerge. As mentioned above, Clearfield and ExpressSun varieties have been conventionally bred to exhibit resistance to the herbicides imazamox and tribenuron, respectively. Some of the herbicides in sunflower are the same as those used in soybean, but a primary difference between the crops is that sunflowers are more likely to receive a desiccation treatment near harvest time. Harvest aid treatments are used to ensure uniform maturity of the crop so that it can be harvested effectively. These types of treatments are almost unheard of in soybean, but are relatively common in sunflower production, depending on the growing region. So even though glyphosate would not be applied to sunflower for weed control during the season, it is possible that some sunflower fields would receive a glyphosate application near harvest time. So if the switch away from GMO soybean to non-GMO sunflower was meant to eliminate use of glyphosate, it wouldn’t be completely successful. Although there would certainly be differences in the herbicides used in soybean and sunflower, based on the information I could find, it is difficult to make a case that one crop would be better or worse when it comes to the herbicide programs. Since there are no insect resistance GMO traits in either of these crops in the US, it isn’t intuitive that the switch would have much impact on insecticide use. The next table shows insecticides used in soybean in the 2012 NASS survey. Because insecticides are used to control insects, they generally have little impact on the crop and most insecticides can be used in many different crops. But even though many of the same insecticides are allowed to be used in a several crops, that doesn’t mean they are used with equal frequency. Judging from the number of acre-treatments, insecticides don’t seem to get much use in the soybean crop. A quick search for insecticide labels found 89 different insecticide products registered for use in sunflower (from Asana to Zyrate), compared to just over 200 products registered in soybean. So even though there is no recent NASS data available for sunflower, we can assume there must be at least some market for insecticides in this crop. Of the 16 insecticides in the NASS soybean survey data, 10 of them can also be used in sunflower. I looked up the insecticide use for both sunflower and soybean from the only year for which sunflower data was available. In 1999, only 2% of soybean acres were treated with an insecticide, compared to 33% of sunflower acres. That’s a pretty big difference, and suggests that insecticide use might be more common in sunflower than in soybean. But only 1 year of data isn’t really enough to draw a strong conclusion, so I looked around for other data sources. As luck would have it, North Dakota State University has been conducting periodic pesticide use surveys for a number of years, and they also happen to grow a significant number of acres of both soybean and sunflower. The pesticide use rates from the 2012 North Dakota survey support the earlier NASS data, with insecticide use being much more common in sunflower than soybean. In 2012, over 60% of sunflower acres received an insecticide spray, compared to only 22% of soybean acres. Similarly, over 30% of sunflower fields received a fungicide spray compared to less than 5% of soybean fields. This data suggest that sunflower is a more pesticide intensive crop compared to other oil alternatives like soybean and canola. This is probably because there are simply more insect pests and diseases that infest sunflower compared to the other crops. Another interesting point from the North Dakota survey is that all of the major crops use pesticide seed treatments, quite possibly neonicitinoids. Although seed pesticide treatments (not specified in this table whether they were insecticide or fungicide) were a little higher in sunflower compared to soybean, both were above 80% of acres.